We enjoyed the warm Southern hospitality and the weather (93 deg!) at the 2005 AGM in Glasgow, Kentucky. The Chief of the Games was His Grace the Duke of Atholl, and the Honoured Guest of the Games was our Society President, the Rt. Hon. 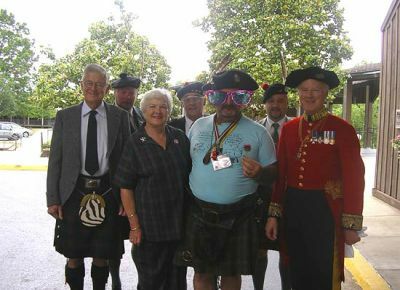 Robin Blair, the Lord Lyon. Lord Lyon attended the joint meeting of the Board and Membership. Board members R. Squire of Rubinslaw, D. Macdonald of Castle Camus, and Capt. M. Lathrop were returned to the Board, and D. Ayre of Kilmarnock was elected to the Board. Captain Glen Cook of Kingerly was chosen as the new Chair and Col. Wm. Boswell as Vice-Chair. Col. Wm. Boswell will also serve as Commissioner for North America, and Kilmarnock as Commissioner for UK & Europe.